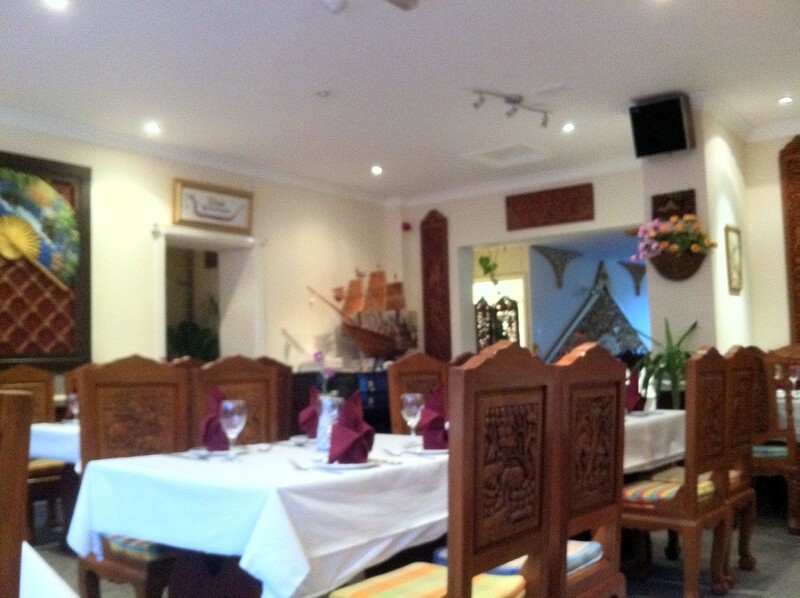 Siam Harbourside, on Hotwells Road, is a fairly large restaurant, with a waiting area for takeaways leading through to a large, sophisticatedly decorated room with ornately carved wooden chairs and wall decorations. We were shown to a table at the front of the restaurant, and brought our laminated menus along with a bowl containing both ‘normal’ and Thai prawn crackers free of charge. After ordering our drinks, it took us a while to work our way through the very extensive menu to make our choices! 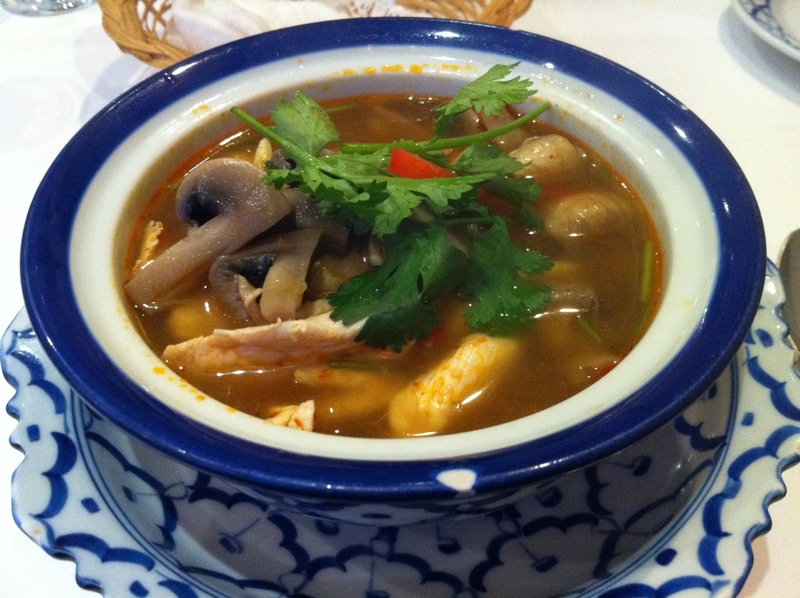 Predictably, I ordered the Tom Yum Gai (£6.95) as my starter. Siam Harbourside are incredibly generous with both the size and quantity of the mushrooms and strips of chicken in the soup, and, while less creamy than in many places in Bristol, it really did have an eye-wateringly powerful level of heat from the chillis that it included, with thick slices of chilli lurking, along with lemongrass and galangal, at the bottom of my bowl. One of the better bowls of Tom Yum soup that I’ve had in Bristol. 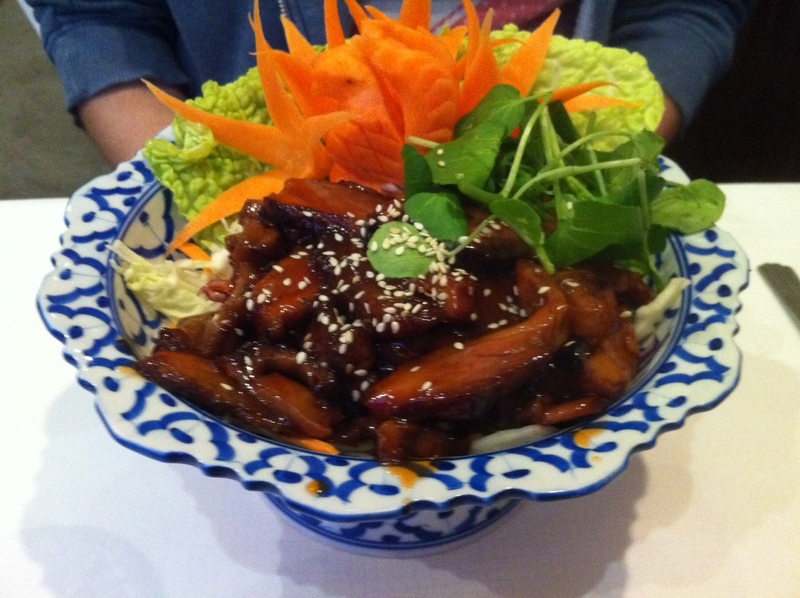 Laura ordered the Ped Nam Peung (£5.95) as her starter – crispy fried duck with a honey and sesame sauce – again, generously portioned, well cooked and happily devoured. 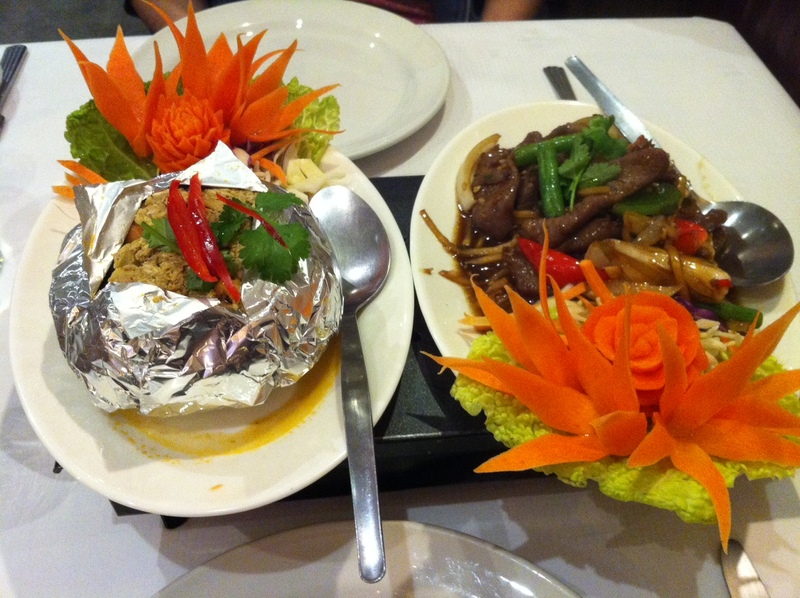 I was a little braver in my main course selection, choosing the Ho-mok Talay (£9.95 – on the left in the picture below). The menu description isn’t quite accurate…it’s not just ‘mixed seafood steamed with Thai herbs with dry red curry and coconut milk’, but a variety of Thai omelette, with a scrambled egg base and steamed in a foil parcel. Don’t get me wrong – it tasted great…prawns, mussels and squid all cooked well, the flavour of the coconut milk dominating (and less heat than I’d expected)…but the greyish colour and the consistency of the dish put me off a little. Laura decided on the nuea phad prig gaprao (£8.95 – on the right in the picture above) – strips of steak stir fried with chilli, garlic, and fresh Thai basil, and seemed happy with her choice – the meat cooked well and not at all tough. Far spicier than she was expecting, though. Note that rice must be ordered separately – I went for a basic Thai steamed rice (£2) and this and the main dish were more than enough to fill me up. Service was incredibly polite and courteous throughout – our waitress was almost deferential, which always makes me feel a little uncomfortable, but always had a smile on her face and we had no complaints. A definite thumbs up for the soup, but I may have chosen the wrong main! All in all, an enjoyable evening, but a good meal rather than a stand out one.